Any quantity available for $24.99 per coin over spot! The Gold Corona was a standard denomination of coinage within the Austro-Hungarian Empire from 1892 to 1916. These gold coins came in a variety of denominations, the most popular of which was the famed 20 Corona coin, though a 10 Corona coin was also widely issued. There was a short-lived 100 Corona coins that has been most popular in its restrike form. Right now, 1915 100 Corona Austrian Gold Coins are available to purchase from JM Bullion as part of that restrike. Arrives inside of protective packaging! Features a commemorative 1915 date mark! Bears a face value of 100 Corona from the Austrian Mint. On the obverse is the left-profile bust of Emperor Franz Joseph I. The reverse includes the double-headed eagle and heraldic shield of the Austro-Hungarian Empire. Each of these 1915 100 Corona Austrian Gold Coins is a restrike issued by the Austrian Mint starting in 1975. The coins were introduced by the mint to compete on the global stage with the popular South African Gold Krugerrand. Coins in this listing are available with protective packaging and are considered Almost Uncirculated plus in terms of condition. A coin in this condition has only the slightest signs of wear and tear on the highest relief surfaces. 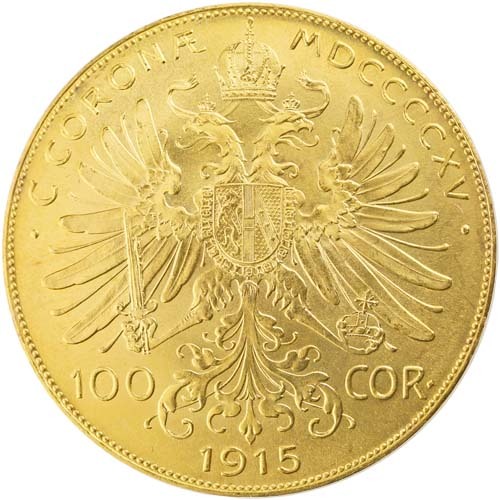 The original 100 Corona Gold Coin of the Austro-Hungarian Empire was issued only in the early 20th century. The 100 Corona denomination joined the 10 and 20 Corona coins in 1908 and was introduced to mark the 60th anniversary of Franz Joseph Is reign as the Emperor of Austria and King of Hungary. The coins were minted between 1908 and 1914, with the 1915 date mark chosen in 1975 by the Austrian Mint as a commemorative mark. On the obverse of all 1915 100 Corona Austrian Gold Coins, youll find the left-profile bust of Emperor Franz Joseph I. Crowned the King of Hungary and Emperor of Austria in December 1848, Franz Joseph I would rule Europes third-largest empire for almost 68 years until his death in 1916. Joseph I oversaw the rapid expansion and growth of the empire, but also its entrance into World War I. That conflict, though he was dead before its conclusion, led to the dissolution of the empire. The reverse of all 1915 100 Corona Austrian Gold Coin Restrikes includes the crowned double-headed eagle of the Austro-Hungarian Empire. The bird holds the heraldic shield of the Hapsburg Dynasty, the ruling family of the Austro-Hungarian Empire. If you have any questions about these gold coins for sale, please contact us. JM Bullion customer service is available to you at 800-276-6508, online using our live chat, and via our email address.